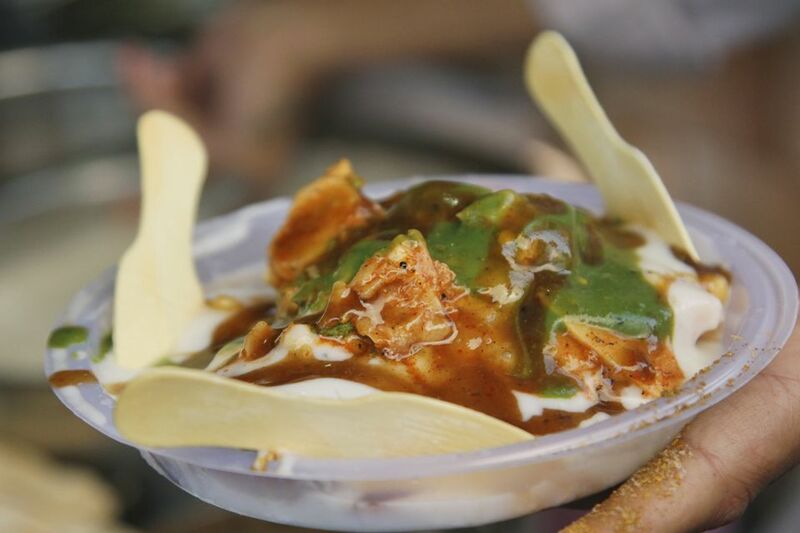 Indians love street food, which often consists of small plates of savory snacks called chaat. The best Delhi street food is without a doubt found in Old Delhi around Chandni Chowk. It's really worth trying some just to taste the different flavors and spices of India. If you're unfamiliar with the area, it's a good idea to take a guided walking tour as it's very crowded and you may easily feel overwhelmed. Delhi Food Walks is one option. A popular sugary treat, sweet jalebis are made out of deep-fried batter soaked in syrup. What's even more indulgent is that the ones at Old Famous Jalebi Wala are fried in pure desi ghee. They're thicker than usual and have been prepared according to the same exclusive family recipe for the past century. Address: Shop 1797, Dariba Kalan Road, Chandni Chowk, Old Delhi. Ph: (11) 23256973. Cost: Around 150 rupees for two people, or 125 rupees for 250 grams. What's good: The jalebis of course! Historic Paranthe Wali Gali became a renowned gourmet location after its parantha shops opened up there in the 1870s. A few of them still exist, including Pandit Gaya Prasad Shiv Charan (1872), Pandit Kanhaiya Lal & Durga Prasad's Parantha Shop (1875), and Pandit Babu Ram Devi Dayal's (1886). Address: Chandni Chowk, Old Delhi. Cost: Around 150 rupees for two people. What's good: Stuffed aloo (potato) parantha, gobi (cauliflower) parantha, and matar (peas) parantha are the most popular. However, these days it's possible to get a wide variety of fillings from lentils to dried fruits. Situated near Paranthe Wali Gali, Jung Bahadur Kachori Wala is a small (not much more than an alcove in a wall) but very popular street stall that's been serving sought-after kachoris since the early 1970s. Address: 1104, Maliwara, Jogiwari, Gali Paranthe Wali, Chandni Chowk, Old Delhi. Ph: 9911401440 (cell). Cost: Around 70 rupees for two people. What's good: Kachori stuffed with urad dal and served with special spicy chutney. When it comes to kulfi (ice cream), some of the best has been made by the Kuremal family in Old Delhi since the early 1900s. There are more than 50 eclectic flavors to choose from, including mango, pomegranate, paan, and tamarind. Address: Chawri Bazar, 1165-66 Sitaram Bazar Road (it's the first shop upon entering Sitaram Bazar Road), Kucha Pati Ram, Old Delhi. Ph: (11) 23232430. Opening hours: 9 a.m. to 10.30 p.m. Cost: 150-300 rupees for two people. What's good: The orange and mango stuffed kulfi. The inside of the fruit is partly removed and filled with kulfi. Yum! Bishan Swaroop can be challenging to find but is definitely worth the effort. It's hidden away in one of Chandni Chowk's unruly side streets, which helps it retain an old-world feel (it has been in business since 1923, after all). There are only three types of dishes on the menu -- aloo (potato) chaat, aloo kulla, and fruit chaat. However, what this place makes, it makes well. If you love potatoes, don't miss it! What's good: The aloo kulla (boiled potato that's scooped out and filled with chickpeas and garnished with spices and lemon). Amid the sights and sounds of Chandni Chowk, this place is renowned for its refreshing fruit chaat. The family who runs it has been in the business for four generations. While you're there stop for a classic cup of chai at Satguru’s Tea Stall nearby. Address: 13, Dujana House, Chawri Bazaar, Chandni Chowk, Old Delhi. Ph: 9811353076 (cell). Cost: Around 100 rupees for two people. What's good: The fruit chaat (fruit salad with spices) is the specialty here. If the sign of a good place to eat is its popularity with the locals, then this shop has to be one of the best places for chaat in Old Delhi. Its decor is average but it serves up an incredible variety of delicious snacks. Adventurous eaters must try it. Address: 1462, Chandni Chowk, Old Delhi. Ph: (11) 23280579. Opening hours: Noon until 10 p.m.
What's good: The papri chaat (crispy fried dough wafers, served with boiled potatoes, boiled chickpeas, chilies, yogurt, and tamarind chutney). This up-market place is perfect for those who want to sample Delhi's delicious street food but aren't keen on venturing into the depths of Chandni Chowk. It's got a great following of expats owing to its posh residential and shopping location and strict hygiene standards. Address: 29, M Block Market, Greater Kailash I, New Delhi. Ph: (11) 29236364. Cost: Around 250 rupees for two people. What's good: The gol gappas (fried crispy shells filled with a watery mixture of potato, chili, and tamarind), also known elsewhere India as pani puri.